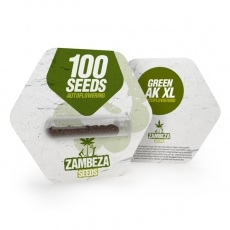 Green AK XL is one of Zambeza’s top performing autoflowering strains. This cross between their Green AK XL and ruderalis really pushes the limits - being able to produce a whopping 400-450g/m² AK goodness in a short life-cycle of only 60-70 days when you grow her indoors. Outdoors you can look forward to harvests of up to 150g per plant. But what’s noteworthy about this is not only her spectacular production - she’ll grow some premium AK-47 bud in the shortest time possible. She does it with almost no compromise when it comes to her flavour or effect. She only has 4% less THC than the feminized version, but this is a good trade-off in exchange for the easiness to grow this type of quality bud in record time. Indoors, Green AK XL will normally reach a height of 60-90cm when you grow her under a 600W light. Outdoors, she will usually stay between 70-110cm, making her just the right size for guerrilla and stealth grows if you want to keep your grow hidden from others. Thanks to the good AK genetics you will likely not run into problems when growing her, a trait that makes AK also a good plant to grow even for less-experienced growers. The taste of Green AK XL Autoflowering comes pretty close to the feminized original. She will delight with the same fruity and refreshing aroma that has wonderfully complementing hints of spiciness with some pine notes. This makes her an amazing smoke that cannabis connoisseurs have loved ever since the first AK entered the scene. Like her bigger sister, she’ll give a very uplifting and euphoric effect, and thanks to her 14% of THC, is not overpowering but still potent enough but this time with some superbly pleasant relaxation added. Indica lovers can hardly ever go wrong if they want to grow AK-47. This is a strain where simply everything is perfect, whether you want some extraordinary production, a spectacular effect and equally great taste. Zambeza manages to top all this with their fantastic Green AK XL Autoflowering that essentially doesn't make any compromises, bringing us everything we love from the AK but now in an easy auto-flower that is pure joy to grow and to smoke. If you require larger quantities of a truly outstanding autoflower, Green AK XL Autoflowering bulk seeds available in packs of 100 seeds will be a top choice!